Can your kindergartener tell the difference between a ladybug and a bee? Can she recognize rainbows and butterflies? Introduce her to ‘Spring Match’ to tell these spring hallmarks apart. 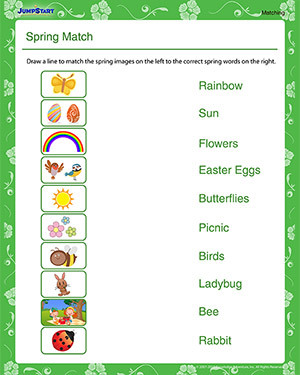 With a bunch of pretty pictures thrown in, this free and printable spring worksheet is guaranteed to be a great hit with the little learners.